Levoit LV-H132 Air Purifier Review - How does it stack up? In this Levoit LV-H132 Air Purifier Review we provide you with all the details you need to make an informed decision as to whether this is the right model for you. We know that there are many benefits with air purifiers and at the end of this article you should have a clear idea of the pros and cons of this model. We detail what this model does well, doesn’t do well, and how it fares compared to other models. First, you will notice an attractive design that will help increase the aesthetic appeal of your home. However, this is not its main characteristics, because Levoit LV-H132 Air Purifier is a great solution that will help you enjoy all the way. Apart from sleek design, you will get an air purifier that will provide you peace of mind when it comes to cleaning the air inside your household. Its central idea is to keep your small areas clean for the affordable price tag. It is perfect for offices, kitchens and small rooms. You will be able to use it with ease, and it features long warranty deal so that you can own it for years after purchase. Who is the Levoit LV-H132 good for? Levoit LV-H132 Air Purifier is the perfect solution for people with allergies because it features HEPA filter that will clean the area you live so that you can enjoy all the way. It doesn’t matter if you want to use it in office or household, because it is powerful enough to clean a small to medium room. The best thing about it is that you can find it for the affordable price tag. According to most retail websites, you can purchase it for less than $100 which is a cheap price when compared with other air purifiers on the market. Finally, you can rest assured because you can use it with ease even if you’ve never used air purifiers before. If you want to increase the aesthetic appeal of your room by adding an extra touch and purification, we recommend you to consider Levoit LV-H132 Air Purifier. You will get a small air purifier that comes in a sleek and attractive design. It features blue light which will illuminate the top of the machine, which is an excellent detail for night use. Perfect for kids who don’t enjoy dark rooms, but may annoy the sensitive sleepers who prefer total darkness to sleep at night.. It includes a three-stage filtration system that will clean your entire room from allergens and filth. The first filter is pre-filter, the second one is HEPA that will catch small particles all around your room. The third one is a carbon filter that will reduce odors so that you can enjoy an odorless room. According to the manufacturer, it will cover all bits and pieces in your atmosphere from large to the smallest particles and odors. It is quite efficient when it comes to removing dust. The pre-filter in combination with HEPA filter will give you maximum air-cleaning ability. It will easily neutralize pet dander, airborne bacteria, fungi, and mold. The HEPA filter can catch large particles, dust mites, and pollen, which is perfect for people with allergies. The third stage filtration includes an activated carbon filter that will reduce odor in your room. If you use it in the kitchen, you can rest assured you will reduce cooking smells, cigarette smoke, and pet odors. This particular model does not come with an Ionizer. Its primary goal is to provide you pollutant-free air and to its credit many users state that they noticed it after first use. At the same time, buttons are sensitive, which means that they can easily break and wear off. We recommend you to use it with caution and carefully so that it works years after purchase. How To Use Levoit LV-H132 Air Purifier? Similar to other air purifiers, it is easy to use and there is not a steep learning curve to sue all its functionality.. Remove any signs of plastic from filters and place them inside the unit. It is essential to make sure that it is 15-inches away from anything around it. Turn it on the appropriate speed. You will have three different possibilities. Make sure that the filter reset button stays the same, because when it lights up, then it is time to replace or maintain the filters. The best thing about it is that you can clean it with ease. You have to wipe it down with a dry cloth. That is everything that you should do to keep the exterior clean from stains and dust. On the other hand, cleaning filters are not possible, so the only thing that you can do is to rid of the dust or replace them. We recommend you to use vacuum cleaner hose to clean the filters from dust, but don’t wet clean and wash them ever. When it comes to air filtration features, the best alternative to Levoit LV-H132 Air Purifier is this particular one. Of course, you will notice a difference in color and shape, because Honeywell is black and angular. At the same time, it features two filters: pre-filter and HEPA that you can only replace after they wear off. If you are seeking another good alternative to the Leviot, then it would be worth looking at the PureZone 3-in-1. It has a 3 in 1 filter, UV-C light to destroy smaller germs and bacteria, 3 speeds and quiet operation. It is a high quality air purifier and has amazing customer ratings. We have mentioned above that Levoit LV-H132 Air Purifier comes with an affordable price tag, which is one of the biggest reasons for its popularity. Apart from that, it includes a robust filtration system, but with some disadvantages. According to users, it is too loud especially during the nights. Other people state that it is loudest when you enter the third level, while first also are excellent. It depends on individual sensitivity to noise and personal preferences, but they are still satisfied with a price tag, warranty deal, and performance. 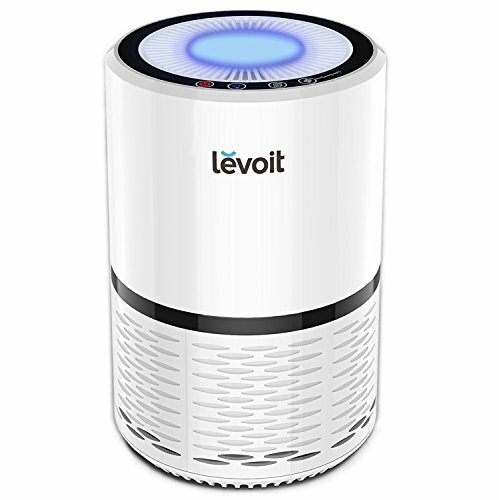 Levoit LV-H132 Air Purifier is one of the most affordable air purifiers that you can get for less than $100. We give it four and a half stars for value for money because it comes with amazing features in combination with a sleek design. However, it can be noisy, which is why we gave it less than five stars. When compared with other air purifiers on the market, finally you can rest assured because it is quite convenient for use even for beginners. We give it a five-star rating for it because you have to add a filter, place it where you want, plug it in the closest outlet, choose the level of performance and enjoy all the way. The design is amazing. However, buttons are lousy when compared with other air purifiers on the market. We give it three stars for quality because a number of users complained about unresponsive buttons after a while. Overall the Levoit LV-H132 Air Purifier is affordable, sturdy, attractive and convenient air purifier that will clean any small to medium room without any additional problem. Like any product, it comes with some downsides but it does perform its core functions well. You can find better solutions on the market, but for this price tag it its one of the top options.. If you have experience with it, we recommend you to tell us all about it in the comment section below! Winix 5500-2 Review – Is this Air Purifier Right For You?